On your website, you have to write copy that speaks to all potential customers, and you probably have a few different personas. On Facebook, however, you can narrowly target your audience. 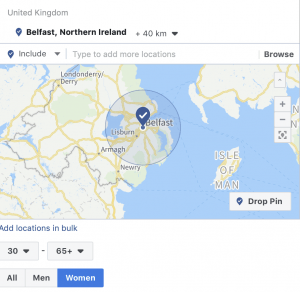 For example, you can target your ads to women who are over 30 that live in Northern Ireland. You can further this by choosing cities, towns or villages, say you wanted to target potential new gym members in Ballymena and are interested in fitness and wellness. 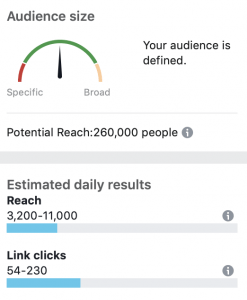 Then you can write targeted ads that speak to that very specific audience. For example, imagine you’re a clothing retailer in Ballymena. You sell men’s and women’s clothing, as well as shoes, accessories, activewear, underwear, and even bath and body products. Many customers will be interested in some of what you have to offer, but many will be most interested in one area. Simply put, women will be interested in what you have for women. Tune in next week, I’ll be sharing some news on what a week looks like in Rapid Marketing!